Don’t forget, you can also order a signed copy. Here’s a list of places to buy Haunted Carlow online. Local bookshops in Carlow also stock physical copies. 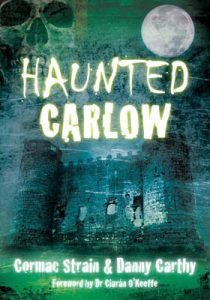 Being a ravenous consumer of all things ghostly, I was anxious to read this creepy little collection of spooky tales from Carlow town, the South-East town about 60 miles from Dublin. Carlow has plenty of history which I’d heard about (Battle of Carlow, 1798 Rebellion) and plenty I didn’t; namely, the intriguing story of Thompson & Son’s, Lucy Slye,Carlow Gaol and even the Banshee. I’m usually more than a little skeptical about stories about the Banshee, largely to do with “D’arby O’Gill and the Little People” but this is the first time I found the hair rising on the back of my neck. Indeed, most of the stories in this book, in particular the “Friendly Ghost”, meant I was looking over my shoulder while reading. This has much to do with the people responsible for the book. The stories are gathered by the men behind Leinster Paranormal, Cormac Strain and Danny Carthy. There is no lurid reportage; no narrative devices that try hard to evince a scare and fail. It is the almost conversational tone of the book that scares the most. As paranormal investigators, you get the feeling that this is all in a day’s work for them – but they’re never going to tell you the “juicy gossip” or speak about the people they help. This style is a blessed relief in a genre that is saturated with clumsily-written, hackneyed accounts of local stories (usually American) that just are not scary, spooky or even believable. This book is the perfect gift for lovers of local ghost stories, those interested in paranormal investigation, and those who like a good scare. I hope that this is the first of many collections of local stories from around Ireland, and if Danny and Cormac ever decide to chuck in their day jobs, a monster collection of Irish ghost stories beckons for them. Hallowe’en approaches….who’s coming to Carlow Gaol?